The review website's cool interactive feature matches neighborhoods with the words used to describe them most frequently. Want to know which neighboods are most likely to provide cheap eats, offer a respite from fratty crowds or leave you with a raging hangover? 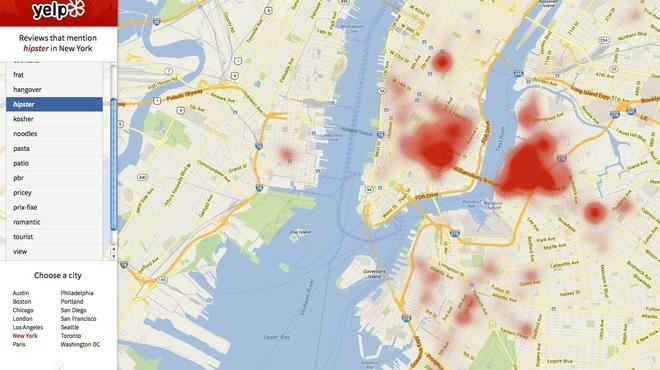 Check out the Yelp Wordmap, which gathers data from the ratings website's millions of reviews to create an interactive map showing the density of keywords such as bacon, yuppie and patio. Though we probably won't rely on the platform to make plans or avoid/find certain crowds (it doesn't take professional data to know that Williamsburg is a hipster hot spot), it's undeniably fun to play around with the Wordmap's list of keywords. As you might expect, prix-fixe meals can mainly be found uptown; funnily enough, frat, hipster and yuppie all have super-high concentrations in the East Village (hey, at least it's diverse); and, sadly, Manhattan is basically one big red dot when it comes to pricey. We wish we could input our own search terms on the Wordmap; some keywords we'd like to see include oysters and cute dogs. Tweet us your keyword ideas (@timeoutnewyork), or leave them in the comments.